The year 1992 marked the centennial of the beginning of the Donghak Peasant Rebellion (東學農民革命) or the 1894 Peasant War (Nongmin Jeonjaeng). That Rebellion fulfilled the prophecy that the Joseon Dynasty would end in its 500th year (1392-1892) and led to Japan's colonization of Korea. 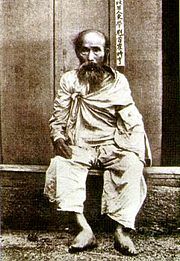 The Donghak Rebellion began at Samnye (near Chonju, the Cholla provincial capital) on December 19, 1892, growing in intensity over the next year and one half. Threatened with defeat by the Donghaks, King Gojong requested Chinese troops to assist in putting down the Rebellion in late May 1894. Japan also sent troops, unrequested, leading to the outbreak of the Sino-Japanese War in July 1894 and the crushing of the Donghak Rebellion in late November 1894. With the victory over China, Japan gained a grasp upon Korea that led to the colonization of Korea in 1910 and to World War II in the Pacific. We will consider the events leading up to the Donghak Rebellion, the life and teaching of Choe Jeu, the events of the Rebellion, and the aftermath of the Rebellion. 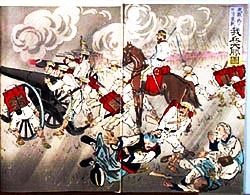 Japanese Army defeating the Donghak Army in the Battle of Seoul. In the 1800s, Europe flexed its imperialistic muscle carving out spheres of influence in Africa, the Middle East, India, South East Asia, the Pacific Islands, and East Asia. The United States issued the Monroe Doctrine in 1823 proclaiming Mexico and South America within its sphere of influence. China (the "Middle Kingdom") attracted the interest of several European powers (England, France, and Germany). Those European powers agreed to share China rather than permit one nation to absorb China in its sphere of influence. The United States, growing into a Pacific power by the end of the nineteenth century, never joined in military adventures to gain territory in China, only to protect American missionaries residing in that country. The United States saved its territorial ambitions for places closer to home; the North American continent, Mexico, the Caribbean, the Hawaiian Islands, and the Philippines. The United States championed the "Open Door Policy" (1899-1900, prohibiting the absorption of any part of China by one nation. As Japan rose as a pacific power in the later half of the nineteenth century, the Open Door Policy became a diplomatic instrument to thwart Japan's growing territorial ambitions in China. As went China, so went Korea. During that time of European imperialism in China (1820s through the 1850s), Choe Jeu, the son of a yangban's concubine (second wife), grew up in Gyeongju province, in the southern part of the Korean peninsula. Gyeongju, Choe's home, had been the capital of the Unified Silla Dynasty (668 C.E. to 935 C.E. ), the first 100 years of which emerged as a Golden Age in Korean history. Silla's Buddhist-influenced art, philosophy, religion, and military science enriched East Asian culture. Japan owes an enormous debt to Silla and Baekje for shaping Japanese culture. Silla, through corruption in the imperial families and through corruption without Buddhist ecclesiastical structure, collapsed in the year 935 C.E., thus ending the southern part of the peninsula's leading role in Korean culture and history. The centers of Korean culture and government shifted to the northern part of the peninsula during the Goreoyo dynasty (935 C.E. to 1392 C.E.) and to the central part of the peninsula during the Joseon Dynasty (1392 C.E. to 1910 C.E. ), never to return to the south. However, Choe and other Korean scholars of the Gyeongju region knew of the prophecy that, according to the Chong Kam-not (Record of Chong Kam), the Joseon dynasty would end after 500 years from its founding (i.e., 1892) and the capital would again move south to Gyeryongsan (west of present day Daejon). In the latter part of the 1800s, Korea's Joseon Dynasty verged upon collapse. Yangban had increased in number to a multitude, many of them desperate for government positions to provide income. The yangban had grown to disdain manual labor and often chose to live in abject poverty rather than work the land. Yangban who held government positions held land tax free. As the percentage of tax free land held by the yangban grew, the tax burden fell increasingly upon the already over taxed farmer. The ever patient Korean farmer had his limits tested to the breaking point by local government officials who needed to recoup the money spent to buy their offices. Korea's dynastic system permits a long period of rule (usually 300 to 500 years) by an imperial line, the beginning of which is creative, healthy, and invigorated. The middle period stagnates, while the latter 100 years is marked by blatant corruption of a flagrant sort. The dynasty, corrupt within, is usually destroyed and assimilated by a power from without. Choe Jeu's time, in the last 100 years of the Joseon Dynasty, fit the above pattern. Little did Choe know that the revelation he would receive from God would play a crucial role in bringing an end to the Joseon dynasty by providing Japan with an excuse to annihilate and assimilate Korea. The Joseon dynasty did, indeed, end in exactly 500 years, as will be shown below. A Cheondogyo temple in South Korea. Choe Jeu (최제우, 崔濟愚, 1824-1894), born the son of a concubine, found himself bared from office by Joseon dynasty policy. Struggling to survive, he experienced, along with fellow farmers, the oppression and extortion of the local governors. Choe's troubles led him to seek answers in the study of the Confucian classics rather than armed rebellion. In April 1860, while in meditation in Yongdam, Choe received a revelation that would lead to the creation of Cheondogyo, the Heavenly Way. In the four years that followed, Choe wrote a number of books that served as the doctrine for his growing number of followers. In 1864, Cheondogyo attracted the attention of the Daewongun, the regent father for King Gojong. In a hasty, rigged trial, the Taegu court found him guilty of practicing Catholicism and sentenced him to execution. His martyrdom only helped to solidify the newly born Cheondogyo religion. 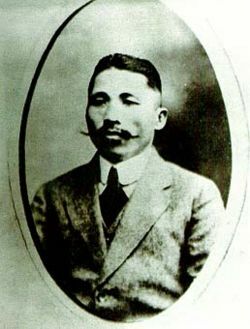 Choe Sihyeong, a distant relative of Choe's, took over the leadership of the fledgling Cheondogyo movement. He published the Donghak Bible, a collection of Choe Jeu's writings in 1888. The Cheondogyo movement continued to suffer at the hands of the royal court and local government officials, yet they never resorted to weapons to address their grievances. Practicing their religion, the Cheondogyo membership increased rapidly from 1864 to 1892. Choe Sihyeong shifted the headquarters of Cheondogyo to the northern part of Korea, leading the movement in maintaining a spiritual posture in doctrine, practice, and content. In 1892, the members of the Cheondogyo movement in southern Korea formed a splinter faction, accepting the popular name Donghak (Eastern Learning). Disregarding the leader Choe Sihyeong's opposition to the, from Choe's viewpoint, untimely protest, the southern faction pressed the rebellion. Government official Jo Byong-gap's tyrannical and corrupt governing triggered the rebellion. Jeon Bong-jun, Kim Gae-nam, and Son Hwa-jung emerged as the leaders of the newly ignited rebellion. On January 11, 1894, led by peasant leader Jeon Bongjun (전봉준, 全琫準, 1854-1895) defeated the government forces at the Battle of Gobu, after the battle distributing Jo's Byong-gap's properties to the peasants. The war went well for the peasants until March 13, 1894. The Korean government reacted with severe repression, triggering an uprising in southern Korea that burst into a full scale uprising in 1894. The government forces, led by Yi Yong-tae crushed the Donghaks, killing and capturing peasant guerrillas, burning villages, and confiscating the peasants' properties in Go-bu. The peasant army rallied and regrouped, rekindling a new rebellion. News of the governments' actions in Gobu help increase support among the peasants. Although the Cheondogyo leader, Choe Sihyeong, initially condemned the southern splinter Donghak group and declared them an enemy of Cheondogyo, when the Korean government indiscriminately attacked and executed Cheondogyo in northern Korea as well, he threw is support behind the southern rebellion. Jeon's army occupied a Jeonju Palace at the beginning of May. They demanded institutional government reform, expulsion of covetous Joseon Dynasty officials, social reform, and the end of foreign influences in Korea. The poorest peasants numbered among the Donghak believers in the peasant army. Meantime, the Joseon government army attacked Jeonju, concluding an agreement with the peasant army. The peasant army in Jeonju dissolved their organization. The Rebellion continued for the rest of the Donghak army. "Do not kill or take the peasants' properties"
"Drive out the Japanese and Western people and purify our sacred land"
"March to Seoul and purge the government"
China sent troops to assist the Korean king. Before they marched against the Donghaks the Donghak leaders agreed to a truce with the throne. Donhak returned to their homes in June 1894. But Japan, citing China's violation of the Convention of Tientsin (1885), which required China and Japan to notify each other before introducing troops into Korea, and which allowed each country to introduce equal numbers of troops, sent troops to Korea. Both countries refused to withdraw. Tensions mounted until the Sino-Japanese War broke out on July 23, 1894. Japan quickly annihilated the Chinese forces on land and sea. As hostilities between China and Japan began, a second uprising erupted in the Korean country-side against a new pro-Japanese government established in Seoul. In late June of 1894, the pro-Japanese forces hatched a plan to wipe out the Peasant Army in co-operation with the Japanese troops stationed in Incheon and Seoul. On October 16, the Japanese army set a trap as the Peasant Army moved toward Gongju for the final battle. The Japanese and the pro-Japanese government troops waited for them inside Gongju. A Japanese scroll records the defeat of the Donghak Army in the Battle of Ugeum-chi. The Japanese had cannons and other modern weapons, whereas the Korean peasants carried only with bow and arrows, spears, swords, and some flintlock muskets. The vigorous battle started on October 22, 1894 and lasted until November 10, 1894. The poorly armed peasants stormed the well-entrenched enemies repeatedly, but the Japanese repulsed them each time inflicting heavy losses. The remnants fled to various bases. The triumphant Japanese pursued the army and eventually wiped them out, capturing Jeon Bongjun, the Donghak commander in March 1895. In 1898, the Korean government captured Cheondogyo leader Choe Sihyeong, executing him and displaying his head at one of Seoul's main city gates. The Korean government, supported by Japanese, crushed the Donghak rebellion. The government addressed many of the peasants grievances later in the Gabo Reforms mandated by the newly established Korean Empire (Daehan Jeguk) in 1897. Korea's troubles continued. Japan and Russia wrestled for control of Korea next, finally breaking out in the Russo-Japanese War of 1905. The Gabo Reforms ended when Japan established a colonial government in Korea after defeating Russia in 1905. This article has been taken with the author's permission in large measure from Daniel M. Davies. The Centennial of the Inauguration of the Tonghak Rebellion (1892-1992). Presented to the Royal Asiatic Society: Korea Branch. February 12, 1992. unpublished. History of "Donghak Peasant Revolution"
This page was last modified on 13 October 2017, at 15:59.